This quilt is a long time coming. I bought the pattern (or generously allowed my mom to buy it for me) at a little quilt store in Massachusetts when I was doing college visits. At this point, that's at least seven years ago. 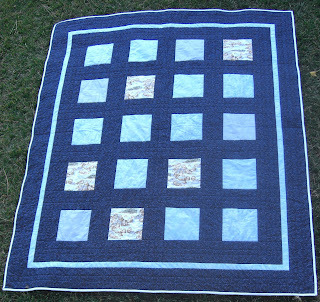 All of the fabric for the center squares was cut out at least three years ago. 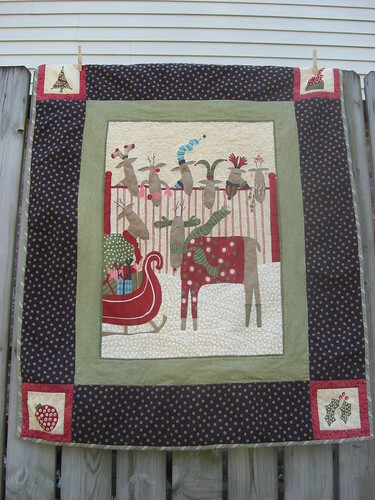 It was all quilted about a year ago, but I packed it up for the summer, not wanting to sit with a big quilt in my lap to bind it during the summer if I was only going to pack it up. So when the weather permitted, this came out. Binding was sewn, threads were trimmed, and a whole bunch of buttons were added. And I love it. And it's for me. For a while at least. *Well, a little short of seven full feet. Finished dimensions are 64" by 80". And I suppose, technically, it's not finished. 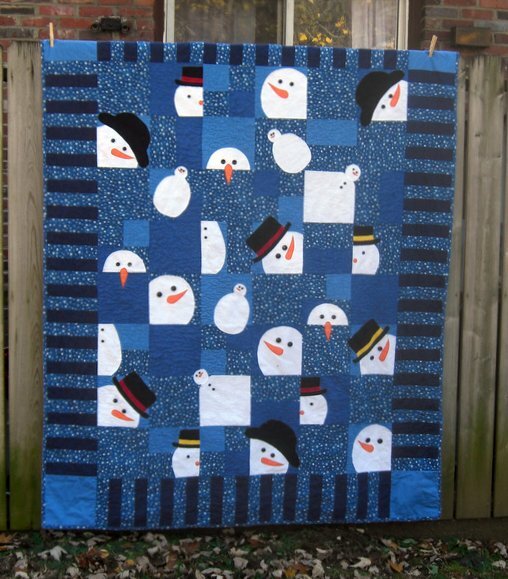 The pattern includes instructions for giving some of the smaller snowmen stick arms and mittens, and adds flowers to the hats of the female snowmen (they're the ones with the curved hats). 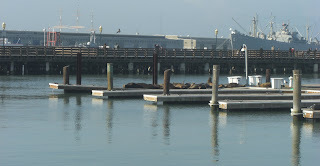 We made our way from Tennessee to Southern California via San Francisco and Monterey. We saw friends and got to tour CSUMB (Nothing hotter than an otter). 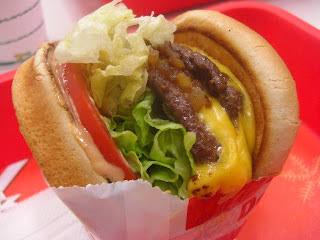 Then it was in the car for a drive down California. After much debate about which route was best, we drove the 101 through some beautiful farmland. Not that it made that much difference to me. Once we were in the car, the vibrations and the warmth of the sun meant I was a goner. Sad, I know. I actually started knitting a hat while we were driving from SF to Monterey and A. asked me whether it would be done before we arrived at his house. Might have been possible if I didn't sleep away 3/4 of the daylight drive! With time out for this. Long, long ago, my mom made this intense jacket. Called the "Me" jacket (I think), it was a patchwork blazer with fussy-cut fabric representing her and important parts of her life. I remember walking around fabric stores with her little plastic square trying to find things that would make a nice patch. I distinctly remember finding one of the more distinctive fabrics. See, when my parents were first married they lived in Monterey, and Mom wanted some fabric with otters on it. I think it was Hancock fabrics that had it. Little otters frolicking on a rocky coast. And when my sister-in-law decided that she was going to Cal State University, Monterey Bay, I remembered that fabric hunt. 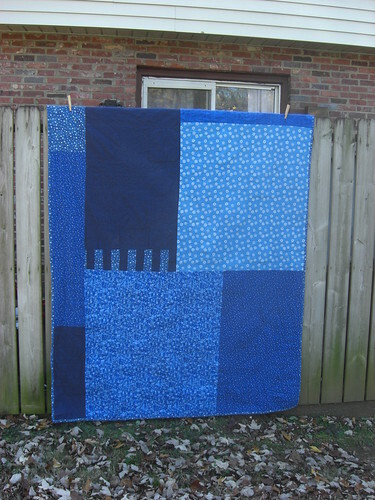 And sure enough, Mom still had the rest of the quarter-yard of fabric that she bought, one five inch square cut out. I got five more 6.5 inch squares. The other light blues are scraps from previous projects (and a little cannibalization from a future project). You've already seen the design. And here's the finished object. I wish I had made the outermost border a little wider. Unfortunately, I cut all the strips before I realized that I had enough fabric to do so. And then I thought a seam down the middle of the border would look silly. 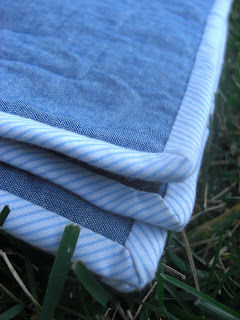 The binding is a blue and white stripe that I got from the remnants bin. Yep. All the fabric except the dark blue came from my stash (or Mom's. Which is really mine too, right?). Oh, and the backing. A chambray sheet that I found at Goodwill. The only blue 100 percent cotton sheet they had in the place, and remarkably awesome. And yes, I've failed at the twelve days of Christmas. I knew I should write these posts ahead of time and schedule them, but I failed. And what am I going to do when friends call and want to hang out? Set myself a curfew so I can write my post for the day? Ordinarily, I spend a long time hemming and hawing over what I'm going to do for family members for Christmas. I really love picking up things that remind me of people, or making things that I know they'll like, but when it comes to the middle of November for people I really feel like I have to give gifts to (immediate family, grandparents, and children under the age of 12 who I will see on Christmas Eve/Christmas Day), I start to get a little stressed. I was in the midst of such a stressed out period (dress up box? Dinosaur play mat? Road play mat with cars? I spy pillows?) 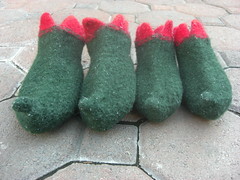 when I saw the Elf Shoes pattern by Flint Knits. And then my problems were solved. Well, at least for the two littlest cousins. I pulled out this green wool from my stash (purchased on clearance at Woolcott's in Harvard Square--closed now, so sad) and dropped by the local fabric store turned local fabric store/local yarn store for the red. 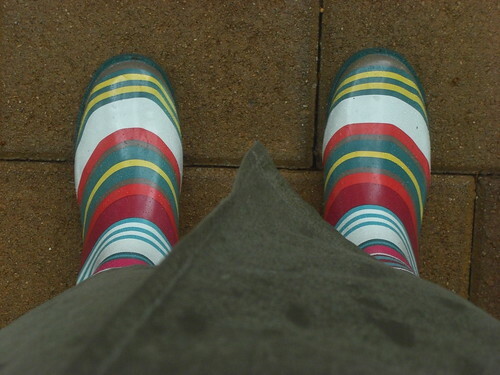 One football game, a lecture on copyright, a lecture on the history of Christmas, a game of Settlers of Catan, and a post-finals party later, and I had four giant elf shoes. A combination of time and lack of hot-water washing capabilities meant that I waited to felt these lovelies until I was in California. Since my in-laws don't wash anything in hot water, I decided to try hand-felting them. I'm no good at it. It didn't take too long before they found their way into the machine with some towels, inaugurating the washer into the ways of hot water. I think they're adorable. The flaps don't stay down at all. I tried wetting them again and letting them dry with the flaps folded down, but I had no binder clips to hold them down. 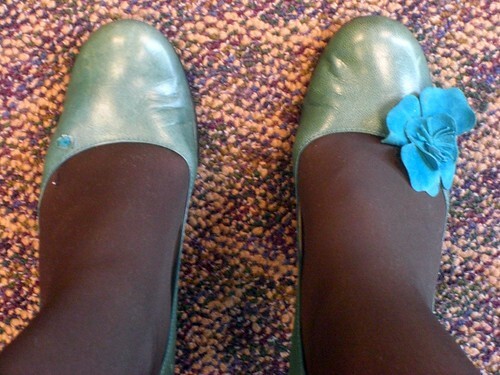 And I might have sewn them down, but I didn't have the right color thread, and I decided it totally wasn't worth it. All of which leaves me with just one question. Why do elves get the cool shoes? Between my husband and myself, we have three sets of grandparents. And I find his grandparents particularly hard to select presents for. So when a local quilt store was going out of business and I saw these adorable panels for $3/yard, that settled it. I'm pretty proud of how good things look together considering the store was pretty picked over by that point. The only thing I got somewhere else was the red sashing around the cornerstones. 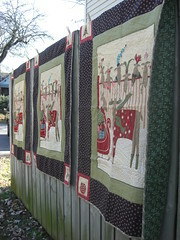 The panel shows eight reindeer. I'm not quite sure who's missing, since Rudolph is there front and center. There's a tradition in my family to read "A Visit From St. Nicholas," otherwise known as "The Night Before Christmas" on, you guessed it, the night before Christmas. Apparently this year they must have gotten into a debate about the names of the reindeer because my dad called and demanded to know what the name of the reindeer that came with Blitzen was. I definitely vote for Donner, but apparently the original manuscript calls him Donder. I think he must be having an identity crisis, and that's why he doesn't show up in these pictures. What do you call the reindeer who flies with Blitzen? Since A. and I got married, we've spent Christmas with his family. Both of his extended families are in the area, so we get to spend time with both sides of the family. 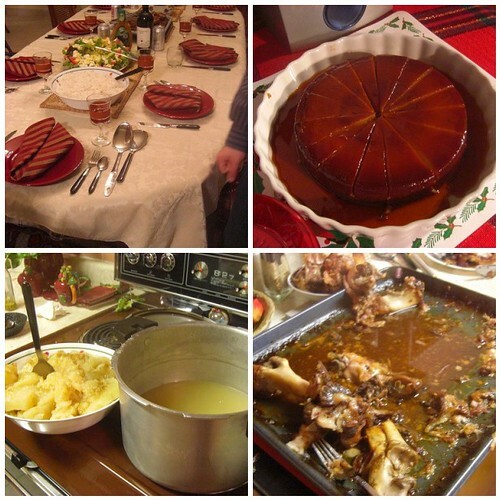 Conveniently enough, one family has their big dinner and celebration on Christmas Eve, and one on Christmas day. And their culinary traditions are divergent enough that it doesn't feel like duplication (except to one's stomach, which is exhausted from the deliciousness). 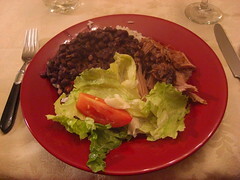 The Christmas Eve menu: pork, black beans and rice, yucca, flan. 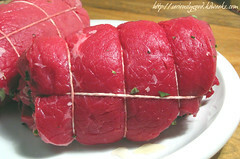 Christmas Day: lasagna, twice baked potatoes, brijole/braciole (beef wrapped around eggs and bacon), etc. Only problem is, I forgot to take pictures, so you'll have to make do with a picture of someone else's brijole. Apparently what you fill it with is personal preference, or at least varies by region. Hope everyone is having an enjoyable Boxing Day! originally uploaded by Martin LaBar (going on hiatus). Merry Christmas everyone! 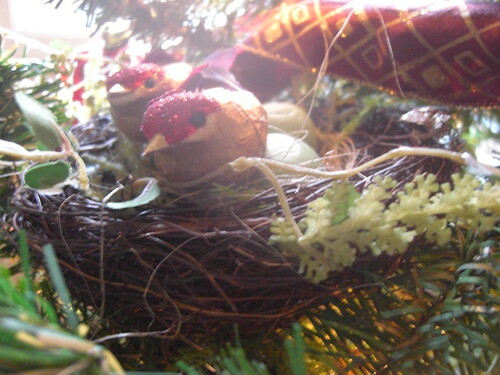 Over the next twelve days I'm going to have my own twelve days of Christmas here on the blog, sharing some of my adventures and creations for this Christmas (I'm a little too excited at my own cleverness, actually). For me, it's important to acknowledge the whole reason we celebrate this season. This morning at church we were asked to bring up the gifts, and for me it was a powerful reminder that the most important gift we have to give is the offering of ourselves, and the most important gift we receive is the offering of Himself for us. May you have a wonderful day full of His love and spirit, whether you're celebrating with family of in your own way. I got this Christmas card/fundraising appeal from the local literacy group. I just thought it was terribly clever and appropriate. 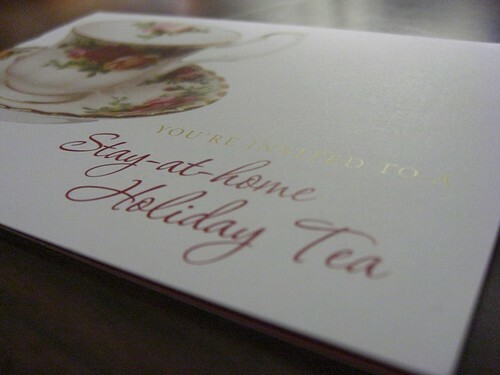 The outside says "You're invited to a Stay-at-home Holiday Tea." 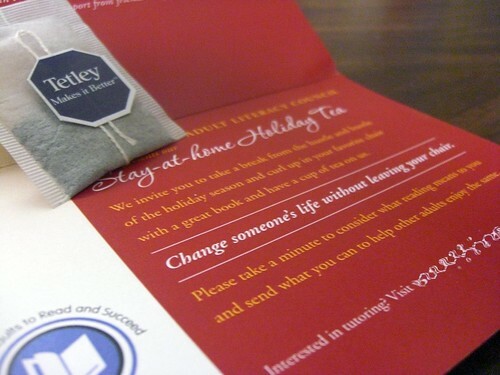 And the inside says "We invite you to take a break from the hustle and bustle of the holiday season and curl up in your favorite chair with a great book and have a cup of tea on us. Change someone's life without leaving your chair. Please take a minute to consider what reading means to you and send what you can to help other adults enjoy the same." Birds in Tree, originally uploaded by aspiringameliorant. 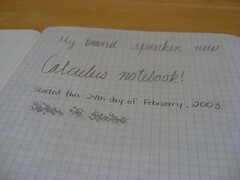 The only graph paper I could immediately lay my hand on was the back of my old calculus notebook. And I had to leaf through it to relive the glory days of my senior year of high school. And so now I will force you to do the same. 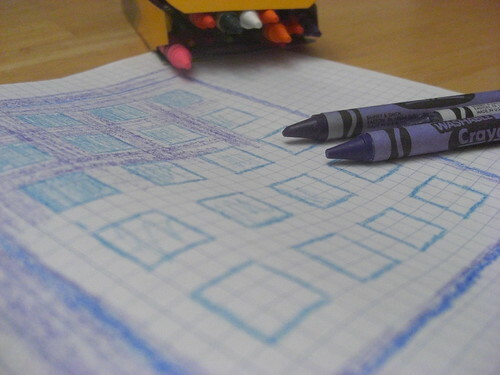 I loved these graph paper composition books. I covered the labels with these awesome postcards. 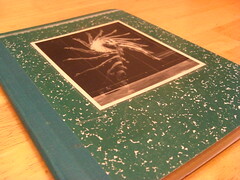 The first notebook had Einstein sticking his tongue out. I think I was destined to be some sort of blogger. Look, I even noted when I started this notebook. Even though it made me feel a little dumb--I don't remember how to do half of this stuff (Which I suppose is why I saved them. So I can re-learn it all. 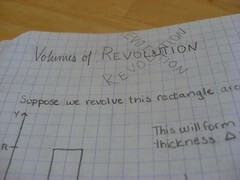 ), I enjoyed leafing through the rest of the notebook. I made fancy titles for each new section. This one was my favorite. 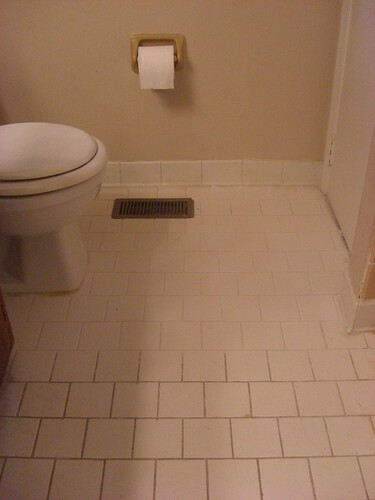 I did manage to get my Thanksgiving projects done, but I also set other people to work. 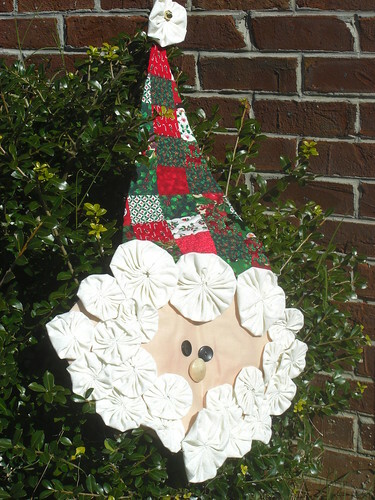 I started Santa at a sewing retreat this spring. We worked on three projects, and I didn't finish any of them. Santa here was just waiting for the yo-yo's that make up his beard, but I still hadn't gotten around to them, despite holding my mom's yo-yo makers hostage for all this time. While I was home for Thanksgiving, I convinced her to do my work for me, so what you see is a collaborative effort. Santa went home with my sister to decorate the house she's living in this year. Whoah, whoah, I'm halfway there! Whoah, whoah, I'm halfway there!, originally uploaded by aspiringameliorant. Yeah, I should totally get to the second half of that floor someday. My parents live about three hours away, which means that holiday trips home are the perfect opportunity to pack supplies for more craft projects than I could possibly finish. Sometimes I have realistic expectations for what I will actually get done, and the rest is there just as backup, sometimes my eyes are just much bigger than my hands. The principal task of this Thanksgiving vacation (other than spending good time with my family and eating entirely too much) was to attach this binding to three quilts. It's lot's o' binding. But with all the movies that had to be watched, and Wii playing to be done by the rest of the family, it got done. 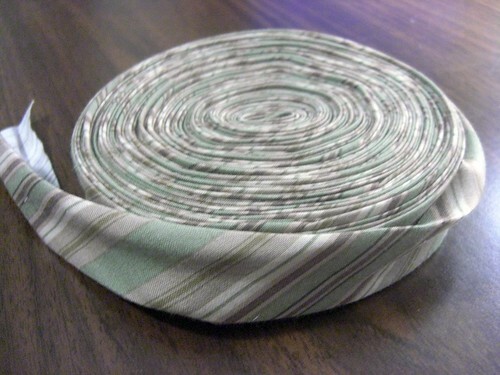 And then, in reference to the second part of the post title, I buried all the thread tails left over from quilting. I'd show you a picture, but it would ruin a surprise, so it'll just have to wait until after Christmas (which, unfortunately is probably the way a lot of my posts in the next couple weeks will go--"I did something cool, I promise. I just can't show you what it was.") C'est la vie.